The next family of PIERS products I will expound upon were acquired not evolved. 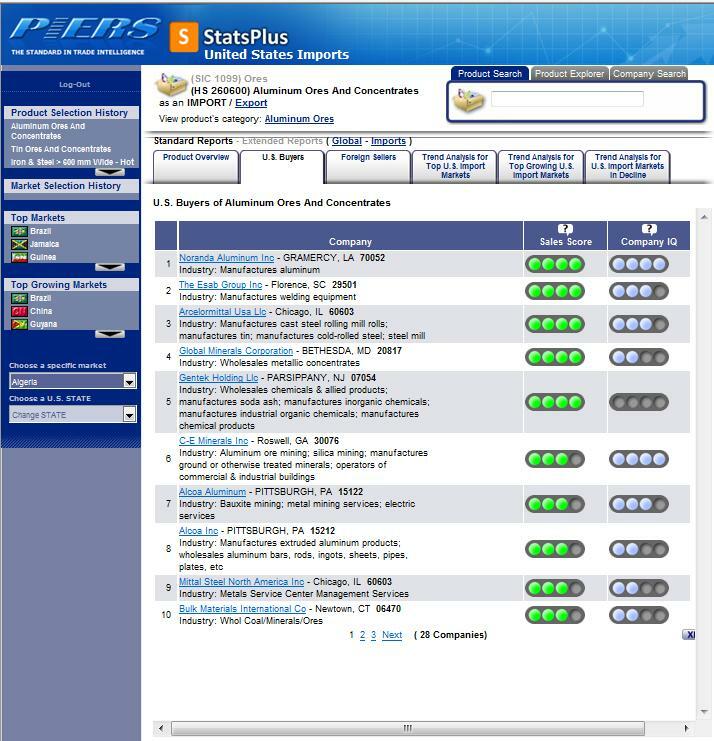 Whereas Piers TI, IPiers, and MyPiers (along with individualized customization and forthcoming dashboards) utilize a common platform and database with varying features, add-ons, and options. Stats Plus, Prospects and Trade Finance are an entirely different ilk. All referenced trade intelligence applications were acquired last year from CenTradeX, the company I developed and directed for 10 years. For those interested, the background, start-up, development, acquisition of CenTradeX Applications by PIERS as well as retained assets that were excluded from the sale have been documented in earlier WTD articles. Furthermore, I’ve already outlined the development and attributes of Stats Plus and Prospects in previous posts too. PIERS Trade Profiles and its sister application, Trade Finance were previous PIERS applications designed for sales prospecting (international trade leads) by the maritime/commercial and financial industries respectively. These products were phased out and replaced by the (CenTradeX) Prospects platform. The only difference between the two applications is that Trade Finance offers several additional search fields and sums up data quarterly (bankers like it sliced that way). Several TI Providers have recently started to offer silos of other data (besides U.S. Customs data), such as Census or U.N. trade statistics. The primary and revolutionary difference with Stats Plus, Prospects, and Trade Finance (again which is really just Prospects) is that they were developed and evolved as INTEGRATED data platforms. 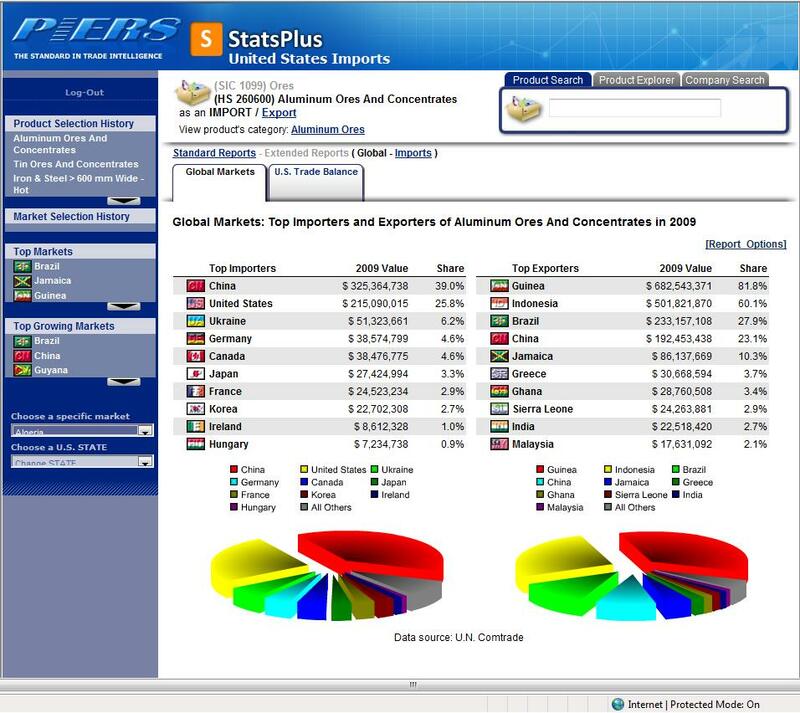 Statistical information (State, U.S., World), Company information (from D&B aka Harris Info and Hoovers, Kompass, Zoom, Yahoo, etc. ), PLUS daily U.S. Customs (transactional) manifest records are all interconnected. They are not contained and accessed from individual, unrelated silos. They are served up as a unified whole. Thus there is greater dimension and depth to the data. Also, integrating third-party information sources with the U.S. Customs data tremendously aids in the normalization and standardization processes. In fact, it is really impossible to do otherwise. For instance, D&B profiles can be employed to normalize the many possible iterations of a consignee name. Statistics can set the context by which to evaluate potential foreign suppliers. These novel PIERS platforms integrate disparate data sources in ways that empower users to get more complete, accurate pictures of international trade as well as the underlying global traders involved. The alternative is to depend upon singular (and incomplete) snapshots taken from transactional (Customs) data, maybe piece them together with other fragments of information gathered here and there from other sources, try to patchwork it all into some incomplete profile by which to then make an (important?) business decision in order to better (successfully?) navigate within the choppy and highly competitive waters of global trade. This week’s series focuses on the 500 pound gorilla and alpha dog of Trade Intelligence Providers, PIERS, a division of UBM Global Trade (along with 7 other related companies) which in turn is one of 17 “business verticals” owned by London-based, publicly traded United Business Media. Download annual report. For purposes of comparison and contrast, we will only be looking at PIERS and their handful of TI products. PIERS company history goes back 175 years rooted in the Journal of Commerce which provides news about global trade specifically related to waterborne freight movements. JOC is one of the oldest publications in the United States, founded by Samuel Morse in 1827. So, in some fashion or form, PIERS and sister companies have had almost two centuries evaluating and reporting on international freight movements. Why is this important? Well, it is definitely one of PIERS’ competitive strengths. Tenured knowledge and experience with obtuse and complex data over time accrues to one a significant advantage that cursory acquaintance can’t replicate. It’s safe to say no one knows the data better. The other obvious advantage is the synergism and strength derived from being connected and intimately related to a multi-national media and information conglomerate with respectable resources at their disposal. A single cruiser may be faster and more maneuverable but in comparison with an entire naval fleet wouldn’t last long in a firefight. They’re the ONLY ones to offer transactional waterborne export data. The combination of reciprocal information exchanges with many ports & carriers along with an extensive staff stationed at ports collecting data is going to make this aspect hard to replicate. 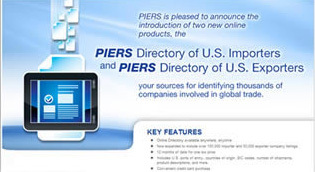 Hence, PIERS is the only company that can provide BOTH sides of the import – export transactional picture. PIERS attributes a harmonized code, many times down to the 6 digit level, to the individual shipment manifests. Consequently, they assign estimated trade values by connecting said code to U.S. Census statistical data. Arguably the values are many times askew, but as they say, “Bad breath is better than no breath at all”. Nobody else even attempts it. They are the best at data standardization and normalization, overall. Many of us have done interesting, innovative and truly remarkable things with U.S. Customs data (and vastly superior in many ways) but the benchmark and standard is and always has been set by PIERS. In the forthcoming articles, we will look at the specific “families” of products (both evolved and acquired) that currently comprise the expansive PIERS arsenal of Trade Intelligence. Almost a year ago today, May 5, 2010. PIERS officially purchased certain CenTradeX Assets, primarily several software Trade Intelligence Applications including PIERS Prospects. Importantly they also hired key CenTradeX technology staff, namely Chuck Wigand, Jared Guy and David Burks. After the sale was completed, the newly acquired tech team went to work on wiring up the Prospects application to the PIERS database engine. PIERS had spent considerable resources over the previous 18 months overhauling their legacy systems with newer, “beefier” technology. Perhaps the rewiring task was not as complicated as open heart surgery, but it was certainly more difficult than replacing an automobile engine. Anyway, winter that same year, they were ready to launch. Prospects is unique in the world of Trade Intelligence. It combines many data sources into one easy to use graphic interface. U.S. Customs Waterborne Import data is matched with D&B Company information as well as various statistical sources. In addition, PIERS adds their proprietary export data (at this point they are the ONLY game in town able to offer data on daily exports) as well as some supplemental referential databases. One of the coolest things about Prospects is that all this data, from individual shipment detail to highly aggregated summary, is searchable by product, company, or region. I haven’t utilized the system since the acquisition but have made a cursory review of the wrappings. A couple things stood out. There is a well put together product brochure: Prospects Product Brochure . They created a fairly comprehensive training video you can view (after providing a bit of summary information): Prospects Training Video. They also offer live on-line training several times a week. Overall, good support I think. One change I noticed is that the user interface comes armed with additional search features that allow for more specificity. Thankfully, it seems to have maintained it’s signature graphic appeal and efficient engineering. I will soon put it through the paces and give it a full evaluation… and let you know the details. A bit of history and background. Initially, Prospects was an iteration of one of our (CenTradeX) applications called “SEEDS” (State Export and Economic Development System). At the time, our primary markets were to state trade offices, world trade centers, trade associations, educational institutions and other non-profits. A friend and business associate, Jack Fain, who at the time was Vice President for Panalpina (a major NVOCC), worked closely with us to modify SEEDS to function as a prospecting tool for his U.S. Sales force. It took several months of dialoging back and forth with his sales team and handfuls of revisions, but Prospects was the result. Several other global supply chain folks added their two cents over the subsequent year or two, but the result is an application that was built with the customer in mind because a customer(s) designed it. PIERS Prospects therefore is THE ideal prospecting tool. It has been and is being used by many companies within the International Trade Industry to pinpoint buyers of their particular products or services. You can find out more about the features of PIERS Prospects by visiting their website. PIERS Prospects Information. If you have used (or are using) PIERS (or previously CenTradeX) Prospects please comment on your experience with the product.